High frequency trading (HFT) is a mechanism only available to the few at the top of the wealth/power pyramid to skim money from markets--please watch the videos below for further explanation of how HFT works. As for inheritance--we're not talking about leaving a house or a small business to one's offspring, or even a couple million of dollars; we're talking about tens of millions or hundreds of millions of dollars. Some states impose an estate or inheritance tax, but at the federal level, the exemption of $11 million per person means a married couple can leave $22 million tax-free. Here is another video (Bill Moyers interviewing Paul Krugman) on Thomas Picketty's book Capital in which Krugman admits he did not see the most important feature of systemic inequality-- inherited wealth, which combined with the above, since wealth gives access to asymmetric information that blatantly rigs the system, generates oligarchy. 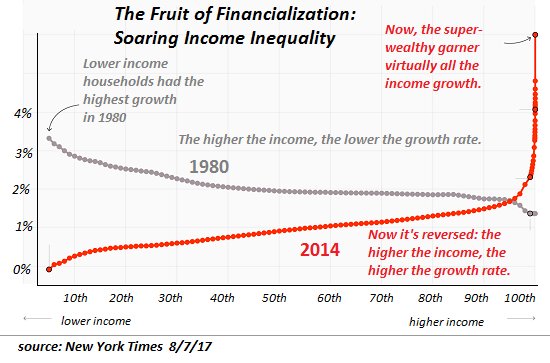 Both of these points really forecast a financial collapse in which the separation and concentration of wealth reaches critical levels, and as Yanis Faroukakis says "idle cash" has no where to go, as all the avenues of wealth generation are monopolized by predators and regular people either become moribund or victimized. 2) "being tired" as in fatigued to play and hope to win and stay in a rigged game, thus bringing down the illusion of a sunny retirement. This is just a matter of time, which is always the case when fundamentals no longer exist and are increasingly substituted with opportunistic illusion. As with all con schemes and pyramid games, they become unmasked and the illusory wealth evaporates to be replaced by IOUs that can never be paid. I don't think we have very many years until this reckoning thanks to Trump's almost autistic savant abilities to unmask and blow up the facades surrounding the global elites. Please note that this is an apolitical reality; neither party has made any serious move to eliminate HFT and similar skimming operations, or limit philanthro-capitalism or onshore/offshore tax evasion--another mechanism that's only available to the top .01% and above. Thank you, Edmund J. ($5/month), for your splendidly generous pledge to this site -- I am greatly honored by your steadfast support and readership. Thank you, Milo L. ($5/month), for your superbly generous pledge to this site -- I am greatly honored by your support and readership.